In April 2013, Brian and Sheryl had the magnificent opportunity to explore South Africa for two weeks. The following article, along with many of Sheryl’s photographs, was pushlished in Destinations Travel magazine in a three-part series. South Africa. Few countries have seen such incredible change in recent decades and yet maintained a sense of continuity, too. The December 2013 death of Nelson Mandela, truly one of the great citizens of the world, once again brought international focus on this magnificent land at the tip of the continent. This past spring we embarked on what we thought might be the travel adventure of our lifetime. I had just retired from the Army after 28 years of service, and Sheryl, meanwhile, was on a two-week trip to the east African countries of Tanzania and Uganda to examine nonprofits and their impact on local economies and communities. I had read a lot of James Michener as a kid; his novels assisted in opening the world to me. I read “The Covenant” when it came out in 1980 and had wanted to visit South Africa ever since. The changes wrought in the country since 1990 by the release of Mandela from prison, the ending of apartheid and the birth of the Rainbow Nation all added to the sense of an epic adventure. What we discovered in these two weeks met, matched and overawed our hopes and dreams for the trip. In early April, I flew from New York on a 6pm flight to South Africa by way of Amsterdam, and landed at Johannesburg’s OR Tambo airport at 9pm the following evening. I was just late for the currency exchanges and asked at the taxi stand about the cost for a ride to our nearby hotel, indicating that I had no rand. The old taxi master told me the price, which was reasonable, and said if I would wait a few minutes he knew a black market rand dealer. I agreed to wait. A few minutes later, he reappeared with a teenager of Indian descent who said he would exchange my dollars for a rate of 8 rand to the dollar, which was slightly lower than the official rate. But who am I to argue at 11 o’clock at night. Standing in the middle of the airport terminal, I exchanged $40 for rand with the young currency entrepreneur. Meanwhile, the old taxi master was watching and said “Black market is good, like Chicago.” The young man rolled his eyes at me and smiled. Rand in hand, I awaited Sheryl, glancing at the board to see that her flight from Kilimanjaro, via Nairobi, had arrived. Soon, she appeared and we headed outside and, before we were able to hail a cab, a young African instead hailed us. He initially asked for 160 rand but when I told him the taxi master had said the ride should be 100, he agreed to that rate. His ancient, dilapidated van finally started after much groaning and grinding of gears. Looking at our expressions, he laughingly told us the van would get us there. During the ten minute drive, we had a nice conversation, learning that he was from Soweto, a sprawling urban poor township on the far side of Johannesburg, and we tentatively made arrangements for a tour when we returned at the end of our journey. We spent two nights and a day relaxing in Johannesburg, recovering from my flight and Sheryl’s intensive Tanzania and Uganda trip. The Protea was a very nice, newer hotel with a conference center. We did not know this at the time, but we would stay at several Proteas across the country during our 15-day trip; they were always very comfortable. On the second morning, we grabbed a cab back to the airport to pick up our rental car. OR Tambo, by the way, has a wonderful new gleaming terminal built just prior to the 2010 World Cup held in South Africa. It is named for Oliver Tambo, a president of the African National Congress and one of Nelson Mandela’s great compatriots in the struggle against apartheid. Previously it had been named for the Afrikaaner Field Marshal Jan Smuts. At Europcar, we rented a Hyundai Tucson ix35 SUV, placed our luggage in the back and headed into the terminal for lunch at the enormous and diverse food court. Leaving at noon, we got in the SUV where I was surprised to find the vehicle was a standard (which I had not driven in seven years) and the steering wheel was on the right side. Just kidding; I had been aware this would be the case months ago when we made plans. But still, the idea was a tad daunting. So much so, that I spent five minutes driving around the garage getting used to driving on the right side of the car and the left side of the road. And then, with Sheryl’s hesitant blessing, we were off. Or so we thought. For neither of us could figure out the signage and we went round and round the airport for twenty minutes. And then, we were off. Or so we thought. For, once on the main highway, we still could not understand the signage and, instead of heading east, we headed west on the N12 right into the heart of Johannesburg mid-day rush hour. Finally after 10 minutes, we recognized our wrong, got ourselves turned around and headed back to the east towards our destination for the first part of our visit. For all intents and purposes, however, this was not a lost half hour as the intense driving of Jo’burg traffic tested my skill and gave both of us a sense of confidence in our ability to navigate our surroundings. South Africa is undergoing a transformation of road and town names at this junction in its history with African names replacing or receiving joint billing with European names and, so, many of our mistakes were often a result of unclear signage. For instance, in this initial failure, the name Witbank, the city towards which we were driving, was replaced by eMalahleni. Once we had this detail figured out, we were much more observant and had zero problems with this issue the remainder of the trip. This experience also highlights the nature of the way we often travel. Other than the initial few days solidly locked in place visiting the famed Kruger National Park and driving the expansive Panorama Route, we had a list of possible places to see and things to do. We realized we were in an incredibly rich country in terms of history, geography and natural beauty. In this way we maximized our flexibility and we would learn as we went along and let the adventure drive us. We had a splendid little SUV, our cell phone, guide books and maps. At last we were on the main highway leading east out of Johannesburg, the N12, later merging with N4. This was a major up-to-date highway, resembling any found in the United States and off we sped at 140 kilometers per hour. The initial couple hours of our journey east were across the highveld, rolling hills and plains that reminded us of the Great Plains of America. Farm and cattle land. Interestingly, we also passed three very large coal-fired power plants—testament to South Africa’s energy sufficiency; from its coal plants, the country produces 95 percent of its own electricity and 45 percent of the continent’s. Just east of eMalahleni, we stopped at a modern rest stop, used the facilities and grabbed a coffee and a cola. We also observed a small nature park adjacent to the stop – complete with rhino, ostriches, emus and other animals. While intriguing to view, we did not count this as yet seeing true African “wildlife,” and continued on our drive. A few hundred kilometers into the journey, we began to descend from the high plateau upon which Johannesburg and the highveld stand at over 5,000 feet. Down the escarpment we went on the winding, rolling path, dropping several thousand feet. On this descent into the lowveld, we saw our first wild African animal. Coming around a corner, a lone black baboon trotted across the highway (two lanes at this point) and stopped to gaze at us as we passed. We tittered excitedly at our first sighting. At about 5:30pm, we pulled into the largest city in the lowveld, Nelspruit (Mbombela), passing a dynamically artistic World Cup stadium and kilometers of new luxury auto dealers. We then headed north on the R538 in the gloaming to Hazyview, our rest stop for the night. Up and down winding mountain roads through forests we went. Held up for about 20 minutes by the side of a forest lake by construction, the African night fell upon us and our last 30 kilometers were travelled in the dark to the town of Hazyview. We found our exceedingly quaint riverside guest lodge, charmingly named Hippo Hollow. Boy were we glad to be off the road after a 500 kilometer drive on the opposite side of the road in the dark. It was an adventure in itself. We both felt confident in our abilities to navigate the country. A delicious South African buffet dinner, with a bottle of Cape cabernet, awaited our arrival. In the morning, we were delighted to see our cottage surrounded by smallish monkeys who scampered and scattered when we opened the door. We breakfasted on the veranda overlooking the Sabie River, checked out and drove back into Hazyview where we fueled up the SUV (gas was double the cost in America) and exchanged more dollars for rand at the local Ned Bank. Here we encountered the ubiquitous South African custom of parking attendants in public places. What I mean is a man, often in quasi-uniform, directs you to a spot and immediately approaches asking to watch and/or wash your car for a few rand. It is not required to pay, but it is the custom. Sometimes we paid and other times we did not. Finally, completely ready, we headed east on the R536 and in toward the Paul Kruger Gate of the famed Kruger National Park. Under bright blue skies, the temperature was rising to a very comfortable upper 70s. Our adventure was truly beginning. Kruger National Park, one of the most magnificent conservation endeavors of the world, was to be our home for the next three days and two nights. Kruger runs 80 kilometers in width by 300 kilometers in length, approximating the size of the nation of Israel. 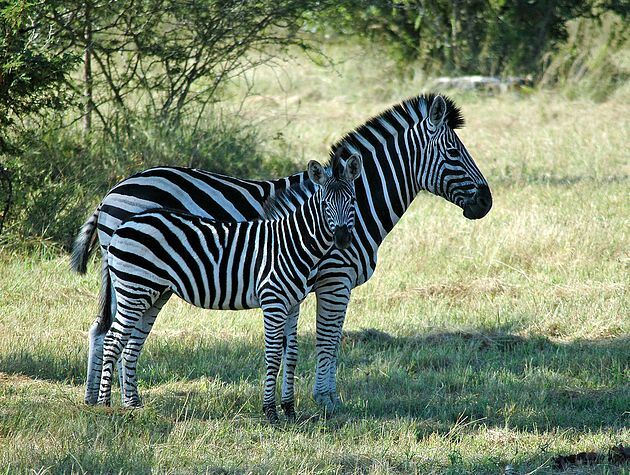 Just about every conceivable animal of southern Africa is found within its fenced borders. About 30 kilometers from Hazyview, we turned off the paved R536 road onto a dirt track and drove toward the Newington Gate, the entrance to the Sabi Sand Private Game Reserve, which shares an open range with Kruger. Sabi Sand is the oldest (since 1934) private preserve in South Africa and comprises 153,000 acres at 1,150 feet elevation (or 4,500 feet lower than Johannesburg). An epicenter of sustainable wildlife tourism on the continent, it is not open to the general public and a visitor will share the experience with only a few other guests of the neighboring lodges. 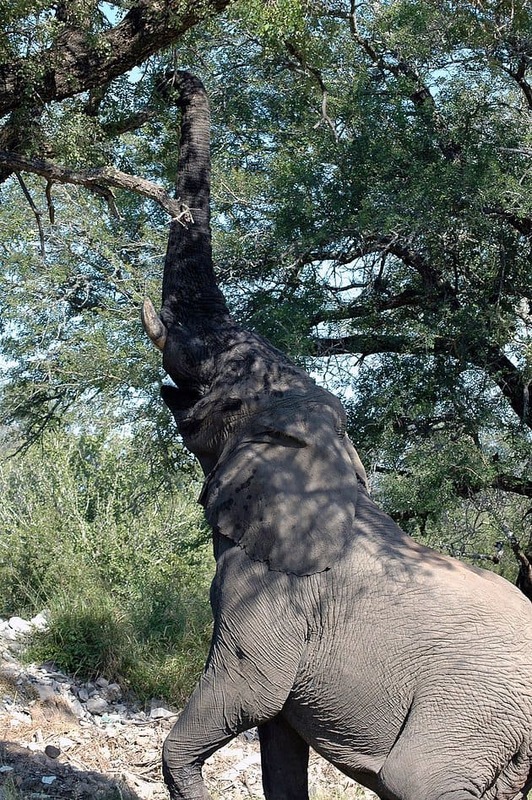 Animals, however, can move freely between Kruger and the reserve. When we planned this portion of the trip, we were not absolutely certain that the price of the private lodge would be worth the investment versus taking our own rental car into Kruger or taking public bus tours. The private game reserves are fairly expensive. Essentially, would the juice be worth the squeeze? Would we really see more animals and, those, more closely? Suffice to say, we were overwhelmed by the accessibility to the animals and wilderness through the incredible professionalism and knowledge of the guides and trackers at our lodge. At Newington, our credentials appraised and confirmed as guests of one of the lodges, the gate swung open and we were off and into the park along a 13 kilometer drive on a sandy, single vehicle dirt track. Immediately, it felt to both of us as if we were entering a sort of Jurassic Park. We were within an electrified fence area in the midst of large and wild deadly animals. The sign had said to stay in vehicles and keep the windows rolled up while driving to the lodge. As we drove, we rotated our heads left and right and within minutes were rewarded with the truly incredible sight of a lone, large African bull elephant. I said, “Whoa, there’s an elephant!” Sheryl punched me in the shoulder and gleefully shouted, “Stop!” and, before I could say “What are you doing?” Sheryl had lowered her window and clambered out upon the door with her telephoto lens. As she proceeded to snap away, a sound that would become very familiar in the next few days, I strained my eyes for approaching lions and wished she would climb back into her seat, which she soon did, all smiles and sparkling eyes. We laughed excitedly and continued our drive. This was really it! Over the next 10 kilometers, we passed within feet of numerous impala, drove over dry streams and creek beds and finally found the final turn of the trail to our lodge. Pulling off the track, we made our way down a sloping trail and entered the Inyati compound, a collection of several bungalows and a few main buildings unobtrusively situated on a grassy hillside overlooking the Sand River valley and an open grassy ridge on the opposite bank. 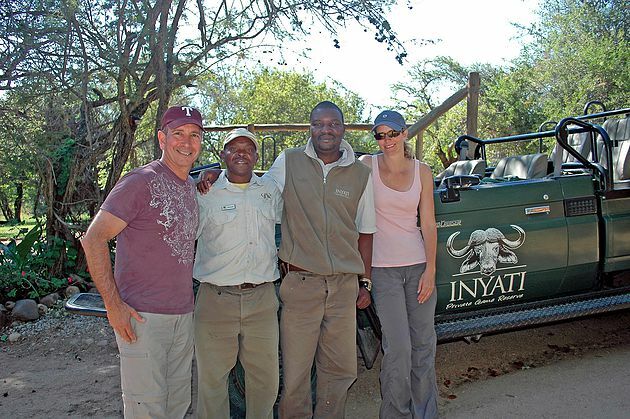 At most, Inyati can house 22 guests and during our stay there were seven to sixteen guests. The lodge has an amazing view and location in complete harmony with the environment. The statuary at the gate to the lodge gave honor to the African name Inyati signifying the Cape buffalo, one of the famed “Big 5.” Pulling into the small and unobtrusive parking area right at noon, we were greeted effusively by the highly effective tandem of Vivian and LeAnn. They showed us to the main lodge veranda, provided welcoming refreshing fruit smoothies, and explained the rules of the camp, some of which we will relate as we go along. Vivian led us to our bungalow, number 8, which was closest to the river, only a few yards away. The efficient staff had already carried our luggage down and placed it in the room. A beautiful four-poster bed was canopied with mosquito netting, reminding us that we were indeed in the malarial zone of South Africa, for which we had already been taking the appropriate medicines provided by our physicians in the US. Arriving back at the veranda, the staff had prepared a beautiful display of cheeses, smoked salmon and carpaccio for our lunch. The kitchen, led by a solicitous South African-Indian chef, was well prepared and stocked to meet Sheryl’s dietary restrictions (a strict gluten-free diet) that we had sent them a couple of weeks in advance. On these drives, we witnessed an amazing diversity of wildlife, almost too numerous to name. 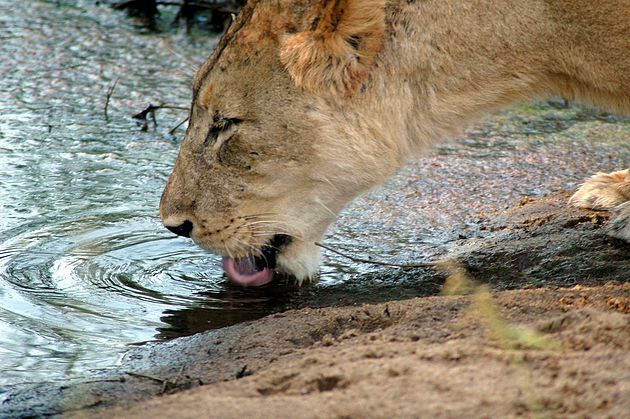 Highlights include the Big 5, of course: elephant, rhinoceros, leopard, lion and Cape buffalo. We saw a male rhino mark his territory the first night and then ‘hoover’ clean a large swath of savannah grass as he grazed. We saw three reclusive leopards during the dusk and dawn periods, two females and their shared male – all beautiful in their spotted coats. There were large herds of sleek and athletic impala. These are comprised of females and young, and one solitary male buck. Some bucks have herds of up to 80 to rule. During our second evening drive we watched as a leopard stalked a herd in the open. The buck spotted the female cat and gave a warning bark. All the impala heads pricked up and soon the impala were ‘hunting’ the leopard, as Khimbini told us. They actually ran towards her, getting and keeping eyes on her, following her and barking their awareness until she disappeared into the bush again, at which time the impala quickly retreated to the relative safety of the center of the open fields and the larger herd. Khimbini called these dawn and dusk encounters, between hunters and the hunted, the ‘rush hour’ of the bush – it’s the time when it’s most dangerous for the prey animals. The following morning drive proved his wise point – as we raced to the report of male lions in a dense thicket. The Land Cruiser rocked like a boat at sea as we crashed through the brush and along barely recognizable tracks. During these types of hell-for-leather races we felt for the safety of poor Nelson on his seat way out in front. Khimbini soon brought us to within 10 feet of four large male lions, brothers all, and we watched in rapt fascination (and, frankly, a bit of trepidation at the closeness) as they devoured an unlucky impala they had caught at dawn. We could hear every crunch as their jaws ripped through muscle and bone. For the most part they ate in solitary as they had ripped the poor impala into pieces. But two of the brothers ate side by side and would, from time to time, roar and growl and slap at each other. So – this is the face of nature, we thought. And at any second one of these lions could have turned and in a single leap been in the Land Cruiser and on us. However, Khimbini explained that the animals were habituated to the vehicles after many generations in the park. And they were accustomed to the sight of humans in the vehicles, sitting and snapping pictures. We were warned, however, to remain seated throughout as a standing or moving human looked different to the animals and they may react unpredictably. Food for thought. Later that morning, perched on the high most-rearward seats, Sheryl and I experienced a ‘whumpf” and felt the irregular motion of the Landcruiser driving on a flat tire. 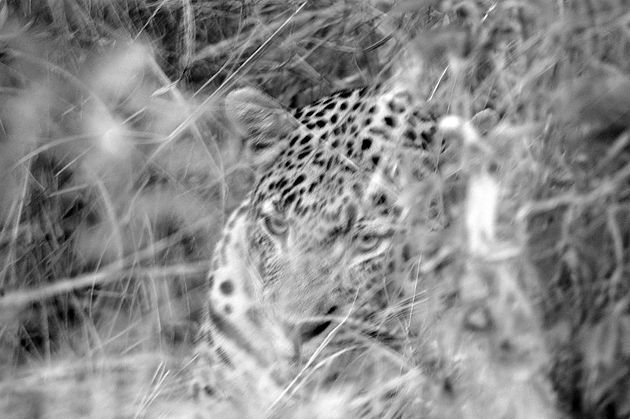 Nonplused, Khimbini continued to drive through the sandy brush until we reached a larger open space. 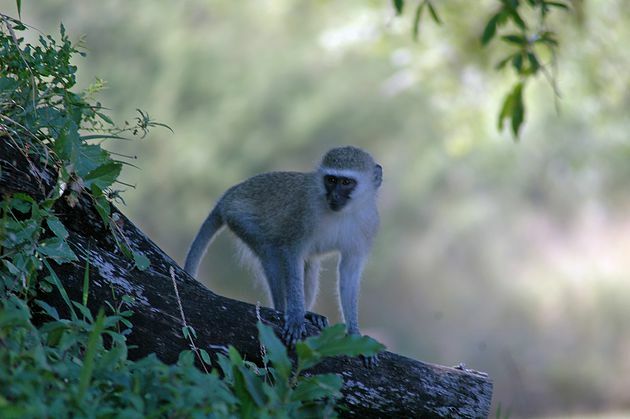 In wild Kruger you want some ‘stand-off’ from the natural inhabitants. And thus we had our morning coffee and tea while Nelson and Khimbini changed the tire. Soon we were driving within 20 feet of huge, awe-inspiring African elephants, following them as they ambled through the trees and bush. One old fellow, perhaps 50-plus years, was particularly large and his technique for ripping tasty limbs off tall trees was fantastic to observe as he nimbly sat back on his haunches and then leaned upward and outward majestically to wrap the end of his trunk about an impossibly high branch to pull it down. We learned that elephants are one of the few animals that never stop growing and that is why the oldest are the largest. We saw many birds – owls, eagles, herons, guinea fowl, numerous songbirds and the water-walking Jesus bird. We observed numerous types of deer from small impala to larger waterbucks and Nyala and huge Kudu. We saw dwarf mongoose, numerous zebra and a large water monitor lizard sunning himself by a waterhole filled with five hippo bobbing their heads up from the water to peer at us. We saw tall, graceful giraffe languidly moving through the savannah, eating their prized acacia leaves while keeping a sharp lookout from on high. 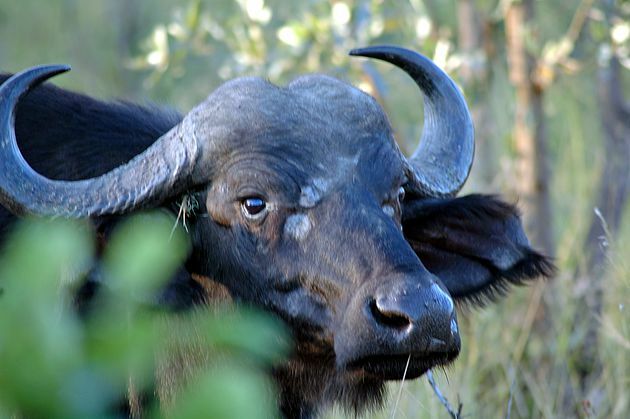 On our second evening we found ourselves in the middle of a large, 300 member, Cape buffalo herd. These animals are magnificent individually but to be in the midst of such a number of them, moving slowly through the bush, eating at dusk as they traveled to their next watering place, was amazing. Later on the drive we saw Sir Richard Branson’s impressive Ulusaba Rock Lodge. We told ourselves we couldn’t really imagine his safari experiences were any richer than ours. Each day at Inyati was a treasure. 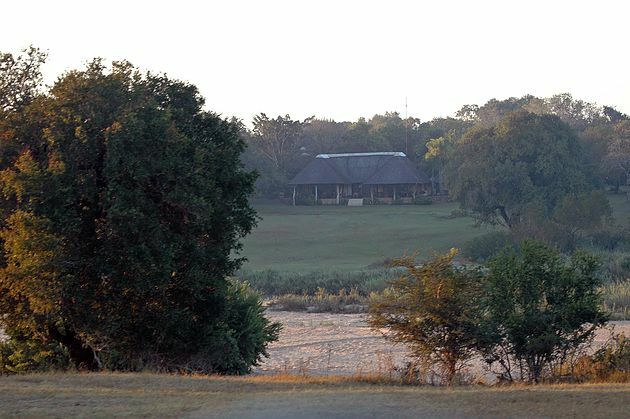 A staff member would stop by our lodge and wake us at 5:30 for the morning drive; after the drive we had an immense buffet brunch on the veranda overlooking the Sand River. The afternoons were spent at the small gym or relaxing in the hot sun by the cool pool. Following a high tea at 3 we were off for the evening game drive. While on the drives we had a small snack and drinks at dawn and dusk – coffee, juice or tea in the morning and wine, whisky or beer in the evening. The atmosphere could not have been more perfect, and time flew by in this almost overwhelming sense of ‘place’ – the outside world was gone. The night skies in Inyati were fantastical to those of us from the northern hemisphere. All the stars were different. It was precisely like the words in the Crosby, Stills & Nash song “When you see the Southern Cross for the first time / You understand now why you came this way.” Khimbini took Sheryl and me aside and explained the constellations and showed us how to tell north by using the Southern Cross and the bisecting two Centauris – Alpha and Beta; simple and exquisite. After the evening drive, dinners on the veranda were sumptuous and relaxing as the quieter evening sounds of the bush took hold. The food, drink and talk flowed among the guests as the night darkened. Khimbini would also join the group for dinner and the second night Sheryl and I sat by him to talk as we ate. We wanted to see what he thought of this ‘new’ South Africa. And find what we could do to help. Sheryl and I have thought of devoting some of our effort to literacy, specifically for young girls and women in areas of need. It was the most pleasurable conversation we had during the trip. Beyond his park ranger exterior lay a deeply thoughtful and engaging man. 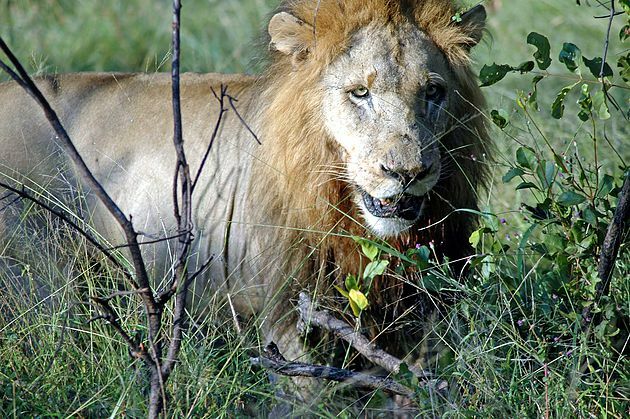 He had grown up nearby to Sabi Sand, just a few kilometers down the road from the Newington gate. His small village of Ximhungwe, through which Sheryl and I had passed on our drive in, had no school house when Khimbini was a child; he and his fellow students had taken their lessons from their one teacher underneath a large tree and had none at all when it rained. Now, the school had grown into a thriving, modern, multi-building enterprise. A large part of the credit for that could go to Khimbini and his friends. He had been raised with the expectation that he would be the first of his family to attend university. And a number of others from his village did go on and receive professional degrees. But his love of nature and animals led him to the decision to pursue rangering and guiding. And, truly, it seemed we were with a master botanist and zoologist every day. Meanwhile, he remained committed to education, including higher education, for his children and his community. Khimbini spoke passionately about how to address motivation issues within both the teacher and student ranks. Joining with 11 other members of his high school community, Khimbini is seeking to infuse the teachers and students with a greater sense of the importance of all students completing their education. The founding members of the alumni association, known as the Mabarhule High School Veterans, are doctors, teachers, business owners and a safari camp manager. Most are college graduates who have returned to their village to try to improve the community, including serving as role models for students regarding positive career options and for teachers regarding the importance of their role in preparing students. Their mission states “We are former students of Mabarhule High School since 1987. We are thankful of what was given to us and we are determined to give back to the community in any way possible. Join our mission of uplifting our community by better preparing the children.” By involving former school members who have successfully started new businesses as role models, students are further encouraged to start their own businesses, perhaps with fresh ideas. Khimbini smiled broadly and laughed his brilliant laugh as he talked about his daughters’ education and their complete expectation that they will go to Johannesburg and elsewhere for their university and graduate degrees. On our way out of Sabi Sand the following day, we made sure to stop by the village school and observe this community’s impressive investment in its children – the hope of the village’s future and that of its nation. After dinner each night at Inyati, it was with an almost indescribable deliciousness with which we returned to our lodge, guided across the lawn by a staff member as wild animals were often about the property at night. And we would collapse into a deeply restful slumber. Two of our most memorable experiences of these days in the Sabi Sand were on our final morning safari. First, we spotted the male and one of the female leopards we had seen on the previous drives. Apparently, the female was just entering heat as she presented herself to the male, who refused the offer and moved on. Khimbini explained that leopard mating is an intense business. 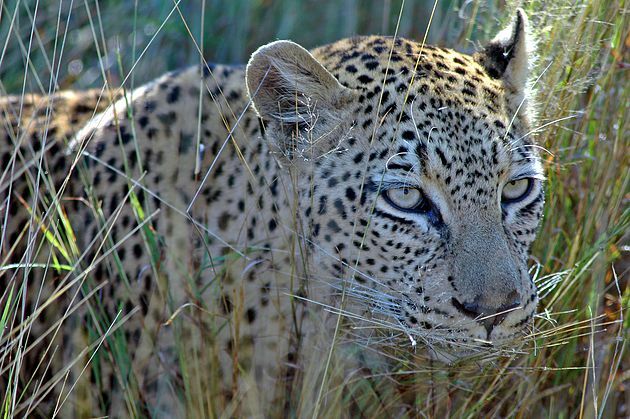 Because leopards mate repeatedly at approximately 15 minute intervals — though more frequently at the beginning — for three days straight, not breaking for hunting or resting, the male must be well prepared to engage. However, upon the second offer, the male complied and we witnessed and heard the intensive growling of several successive encounters. 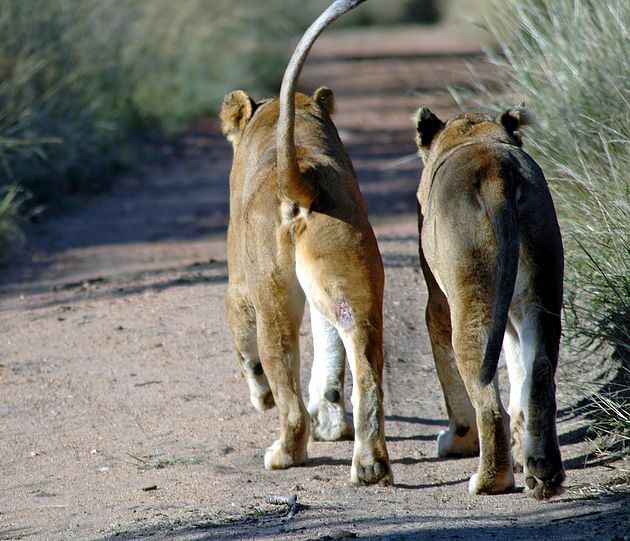 Next, we spied three lioness sisters sauntering along a path after an unsuccessful early hours hunt. They were on their way to reunite with their seven cubs, ranging in age from five to seven months. At one point, the sisters spotted a warthog and the lions, with nary a sound, padded off in three separate directions to surround the beast. The smart little tusker, however, recognized his dilemma and promptly hid himself in a group of Daga Boys—a small herd of five elderly Cape buffalo bulls who, beyond their mating prime, voluntarily separate themselves from the main herd and travel solo or with other old bulls. According to Khimbini, these ancient bachelors remain fiercely dangerous warriors and, with lowered heads, promptly chased off the lionesses. Foiled in this hunting opportunity, the sisters shrugged off their losses and continued home, stopping at a watering hole for a cool drink. 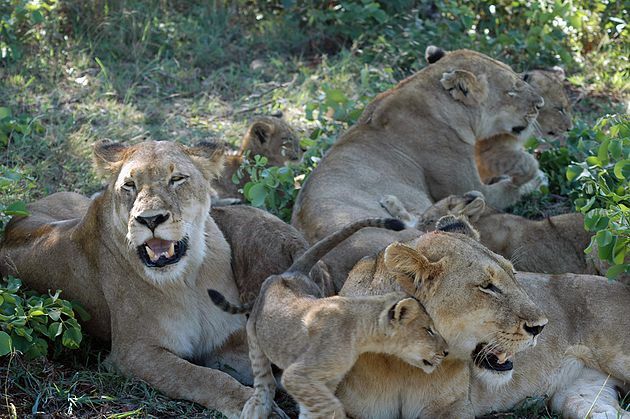 The joy in the cubs as they reunited with their mothers was awe-inspiring. The cubs traipsed across the trail and into a wide grassy field, mewling, playing and rolling with each other and the mamas. 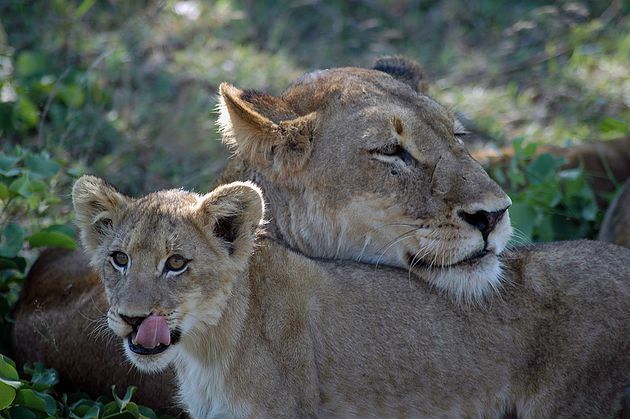 When they settled in some low grass, the cubs nuzzled the mamas, receiving licks of affection, before they moved in to nurse. From our vantage point just two meters away, we observed the warmth and love of this pride for about an hour. Back at the Inyati lodge at noon, we took our leave of Khimbini, Nelson and the rest of the staff, loaded up our SUV and headed out. Upon leaving the lodge, a large troop of baboons, the first we had seen in the park, crossed our path and we stopped to photograph them. From that point, we reversed our route and were soon in Hazyview, heading northwest toward the Drakensberg or “Dragon Mountains” – and their rugged spine truly does resemble the great serpent! Climbing the steep escarpment from the low or bushveld we stopped for lunch in the charming town of Graskop and visited the local tourism center where we picked up a map and chatted with a very helpful agent. We then embarked on the aptly named, beautiful Panorama Route. This roughly three hour drive took us along the escarpment edge of the high and low velds. We stopped and took short hikes to majestic vistas of mountains and far-distant forests. 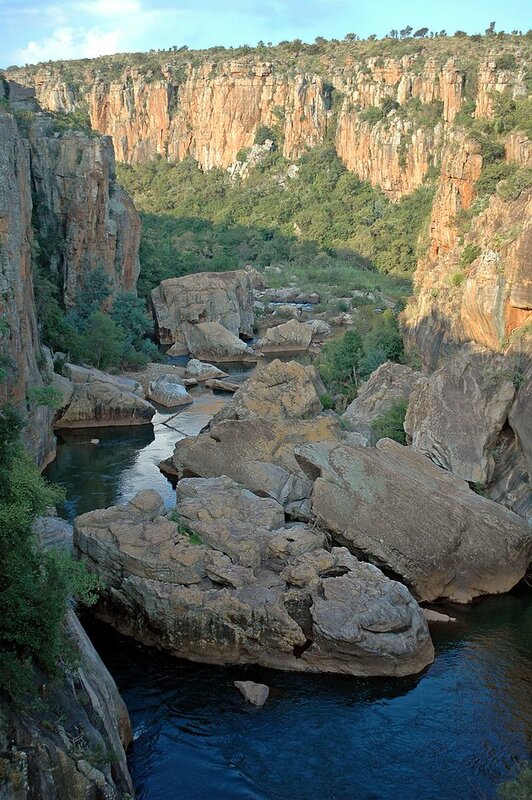 The 11 mile stretch of the Panorama on the R534 runs right along the edge of the 3,200 foot sheer drop off the escarpment and has some of the most beautiful and spectacular scenery in all of South Africa. With names like The Pinnacle, God’s Window, and Wonder-View one might think it rather fanciful; until you have seen it yourself. We stopped and took short hikes to view several spectacular cataracts that form part of the Waterfalls Tour. 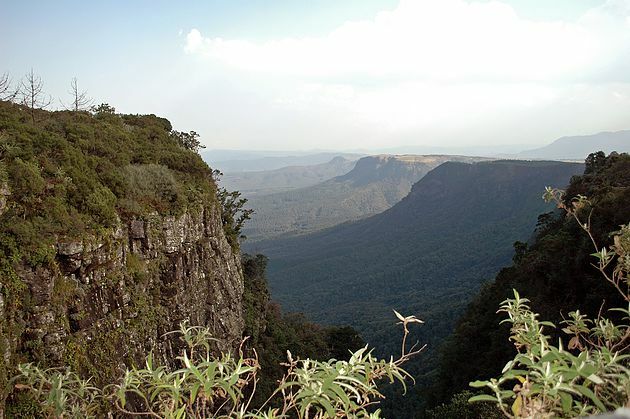 High ground and generous rainfall have created more falls in this area than any other in southern Africa. One, the Berlin Falls off of R532, has a small stream cutting through a natural sluice that appears to spring directly from the rockface and drop 260 feet to a dark green pool below. Just north of these falls we came to the headquarters of the Blyde River Canyon Nature Reserve. The confluence of the Blyde (“joyful”) and Treur (“sad”) rivers here led to a whirlpool effect of swirling waters carrying grit and stones that carved amazing cylindrical holes in the red bedrock. 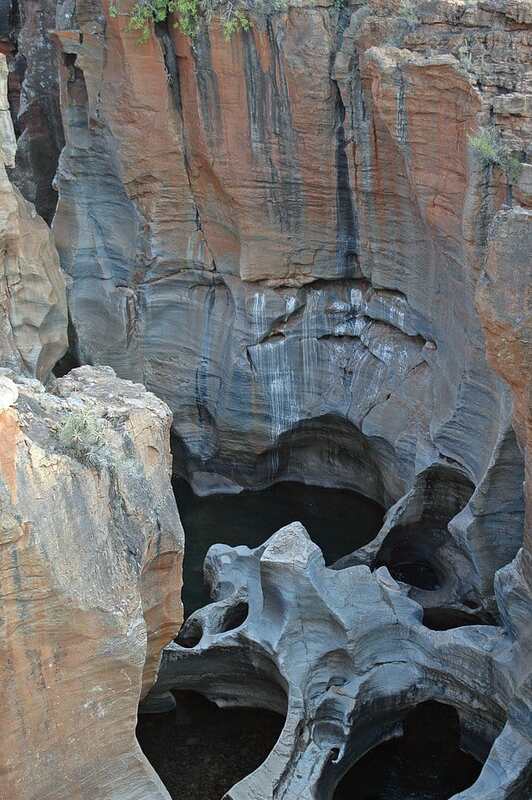 Bourke’s Luck Potholes are truly dramatic formations of falls and pools. This was a heavily visited spot; in fact, it was the most tourist-dense stop along the entire route that day and included busloads of schoolchildren. As the sun slipped lower in the west and our light began to wane, we drove through winding mountain roads through the Drakensberg and the towns of Blydepoort, Ohrigstad and Lydenburg (Mashishing). An hour after nightfall, we found ourselves in the quaint town of Dullstroom and halted for dinner. As we got out of the car, we immediately noticed a slight chill and smell of pine in the air. Right on Huguenot, the main street, we found the Dullstroom Grill in The Gables with a warm, rustic feel. We sat by a roaring fire and Sheryl had a traditional kingklip fish and I had a fabulous rumpsteak. Talking with the manager and lone waiter, the only other people in the restaurant that evening, we learned that Dullstroom is the trout fishing capital of South Africa and a very popular mountain destination. At 6,900 feet, the town of 600 (it swells greatly in season, which April is not) is situated at the foot of De Berg, the province’s tallest mountain and boasts the country’s highest railway station. 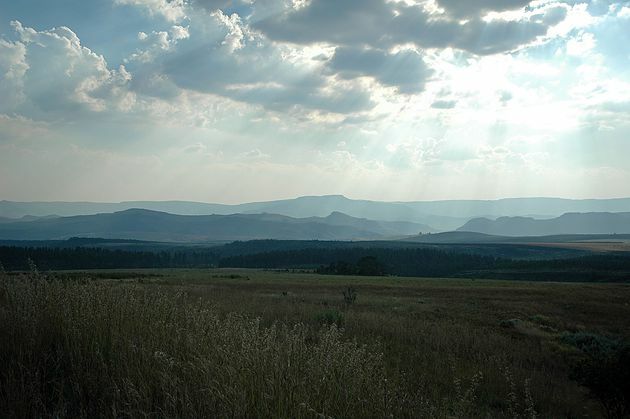 Dullstroom’s unique sub-Alpine micro-climate, akin to a Scottish moor, allows a proliferation of flora and fauna in a small area. Meanwhile, the ambience, fireplace warmth and fresh mountain air, such a striking contrast to the heat of Sabi Sand, prompted us to take a room in the guest house above the restaurant. The following morning dawned bracingly cool and misty, typical for this time of year in the mountains. We looked into getting our morning drinks at the locally famed beansaboutcoffee specialty roasters but they were not yet open and, instead, we got coffee and chai from the nearby Seattle Coffee Company. The young South African owner showed us about the new place, into which they were in the process of moving. We then said our goodbyes to this pleasant town and began our trek back toward Johannesburg and, eventually, Cape Town and the Cape of Good Hope, the beautiful South African wine country, and the Garden Route. This ‘adventure of a lifetime’ had already exceeded our dreams and with glad hearts we raced westward in discovery.